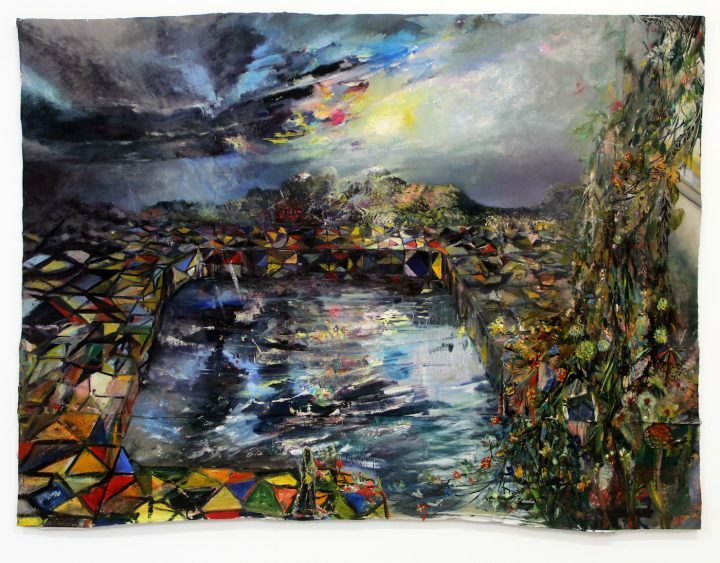 Women are everywhere in Paula Wilson’s art, which cobbles together fragmented images like shards of stained glass. Still from Paula Wilson’s “Salty and Fresh” (2014), video, 8 mins 30 secs. 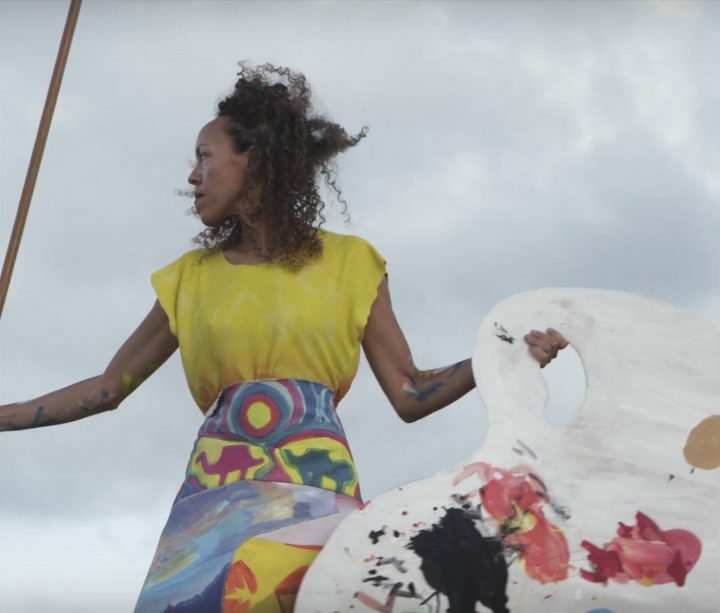 MIAMI — In Paula Wilson’s short video, “Salty + Fresh,” the artist becomes a giant goddess, tall and massive, rising from a mid-ocean sand bar on Virginia Key, her long, painted skirt lifting her like a turret. She wields a giant palette and an even bigger paintbrush, with which she paints three bodies, each carrying clay pots on their heads (to be clear, Wilson paints their butts, and only their butts). 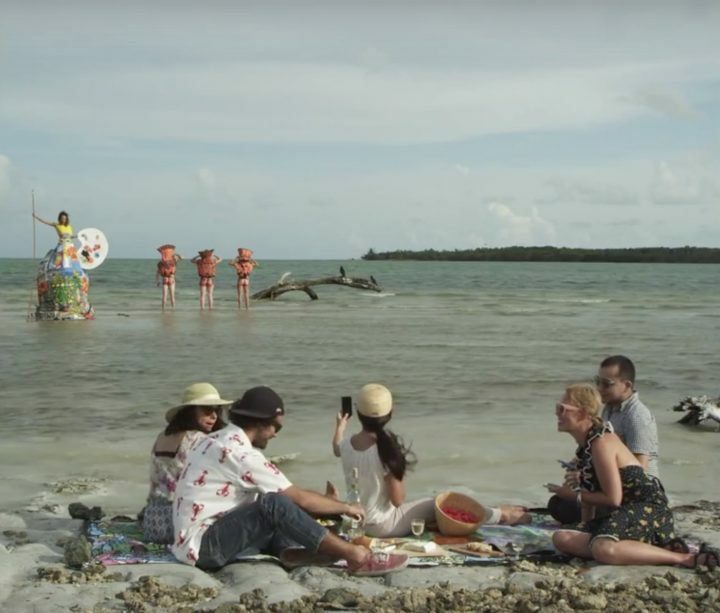 Tipsy picnickers on the sand watch her, less nonplussed than vaguely amused, and they snap photos with their phones, in the way that disinterested people often do — not totally disconnected, not wholly present either. Wilson looks too small in the viewfinders of their cameras; still, she is defiant, and she is huge. Virginia Key Beach, a swath of coastline on Virginia Key, an 82-acre barrier island in Biscayne Bay, has — even on clear days — a faded pallor, as if the sun mellows its shine once it hits the sea. The mud at the shoreline is smooth and gray, and the sand is faded white, but this pale phenomenon is unmeasurable, inexplicable, and likely the product of my imagination. Though they’re unusual adjectives for a place, Virginia Key Beach feels exceptionally soft and subdued. It is one of my favorite beaches in Miami. On August 1, 1945, it became Miami’s first “colored-only” beach, in response to a wade-in on May 9 of that year, when four black men and two black women stepped into the sea at Haulover Beach Park — then only open to whites, like all of the city’s beaches. Access to Virginia Key wasn’t easy before 1947; until the Rickenbacker Causeway was built, black beachgoers took a ferry from the Miami River, and some built rafts themselves. Napping on the sand today, there is nothing to indicate Virginia Key Beach’s past. While we’re basking in it — blissful and momentary — nature seems exempt from fraught narratives. Wilson, who works with many mediums but especially paint, doesn’t so much retell stories forgotten to time as she does create new ones entirely, alluding to fragmented histories as she shapes her own. It’s impossible to extricate the theme of stained glass from its religious framework, and though Wilson grew up atheist, the visible devotional reverence is intentional. In a piece appropriately entitled “Stained Glass Vision,” a brown-skinned woman opens her palm, one arm jauntily akimbo, to reveal floating, gem-colored shapes hovering above her hand. 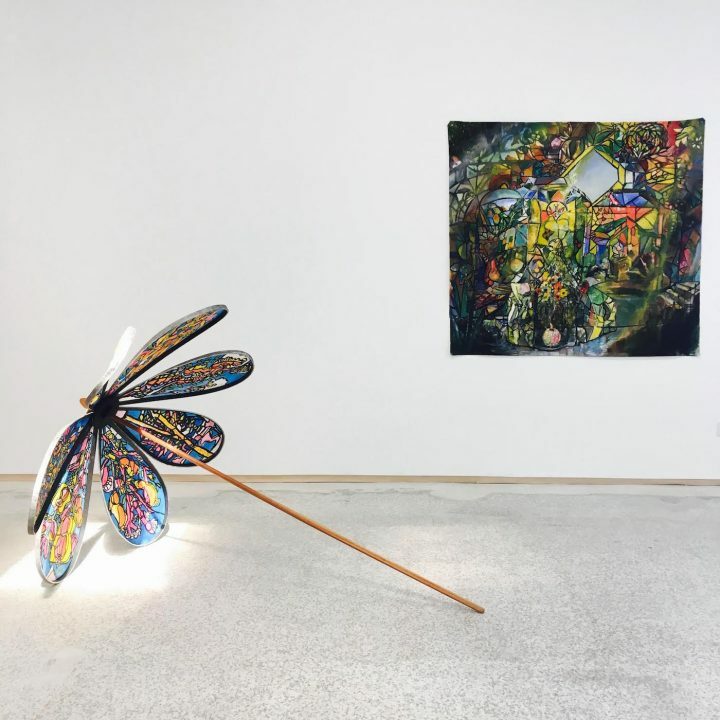 She’s surrounded by kaleidoscopic mosaics of glass, while an overturned clay pot reading “LOOK HERE” seems to give birth to an incomprehensibly massive plant. “Stained Glass Vision” hangs from a wooden hanger and has the effect of a tapestry displaying something holy; here, it’s the woman, smiling as if entertained by her own magic, who is all-powerful. Women are everywhere in Wilson’s paintings. In her own take on the “Three Graces” — she frequently upends and pays homage to ancient Greek art — the Graces are red, yellow, brown, and support each other protectively. In “Inside Out,” the main figure, a woman, is silhouetted, gazing at a triptych of images: yellow-framed images of a couple kissing, a rainbow of color, and a brown woman with a stained-glass umbrella (nearby, a wood-crafted parasol that looks more like a giant flower rests on the floor, waiting to catch the light). Wilson proposes a new kind of deity — a sensuous, introspective woman whose strength is mysterious only because it’s potentially endless — and a series of prismatic churches in which she may be exalted. This same enigmatic, feminine energy is found in the water, its own kind of temple. In “Reflection Pool Near Nogal Peak,” the exhibition’s single landscape and the only piece with a dark palette, the titular pool has an unknown depth; it may have no floor at all. One imagines that the Virginia Key goddess might arise from that pool, bigger than ever. 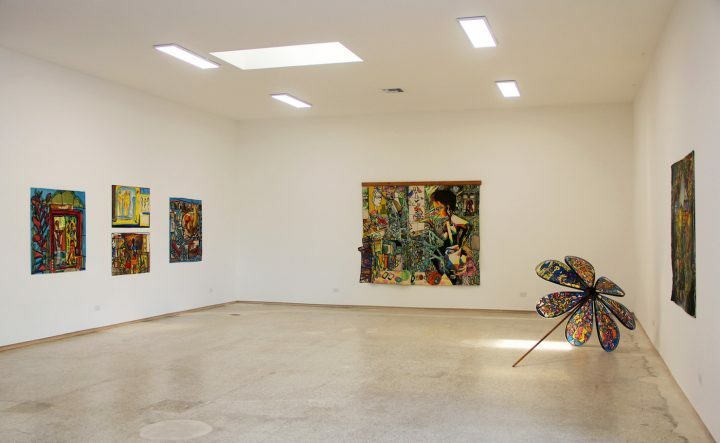 Paula Wilson: Salty + Fresh continues at Emerson Dorsch (5900 NW 2nd Ave, Miami) through May 13.